Rescue and HAZMAT workers, fire-fighters and miners depend upon self-contained breathing apparatus (SCBA) when working in extremely hazardous environments. So when Biomarine, an SCBA manufacturer based in Exton, Pa., needed to improve the impact strength and ability to dissipate static electricity for the external housing of its BioPak 240R Revolution rebreather, it turned to SABIC’s Innovative Plastics business. SABIC recommended replacing the existing polycarbonate (PC)-based compound with LNP™ FARADEX™ compound – which leverages proprietary LEXAN™ EXL copolymer technology and features electrically conductive stainless steel fibers – and provided world-class design and molding expertise. The result is a tougher apparatus housing with excellent electrostatic dissipation (ESD) and greatly enhanced aesthetics. The SABIC-Biomarine collaboration showcases SABIC’s ability to help solve key performance, quality and cost control challenges, giving customers a competitive edge in the markets they serve. ESD capability is important for rebreathers because it provides a grounding path for any static charge that can build up in a plastic resin, causing potentially deadly sparks. FARADEX compound incorporates conductive stainless steel fibers throughout its base material to help dissipate static charges. Because the conductive property permeates the entire part, it helps to provide consistent protection, as the conductivity cannot be disrupted by surface scratches or nicks. As the base material, LEXAN EXL copolymer offers superior impact and low temperature ductility, as well as enhanced processability, compared to standard PC grades. All LNP FARADEX compounds are Restriction of Hazardous Substances (RoHS) compliant, and grades based on non-brominated, non-chlorinated and flame retardant systems are available. Another key attribute of LNP FARADEX compound is its ability to be pre-colored, avoiding the need for secondary painting. This material is also ideal for electromagnetic interference/radio frequency interference (EMI/RFI) shielding applications such as consumer and defense electronics, healthcare and industrial equipment and telecommunications hardware. In addition to supplying the FARADEX material, SABIC’s team provided extensive technical support to Biomarine and the molder of the rebreather housing. These included recommendations on notch and snap-fit design, adjustments to gates and runners and assistance with color matching. The Biomarine BioPak240R Revolution is the most highly advanced, easiest-to-use four-hour rebreather ever offered. 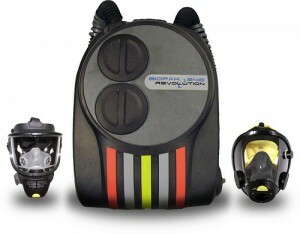 With six liters of tidal volume, it delivers the lowest resistance breathing of any rebreather available. A revolutionary, Solid Core Scrubber® carbon dioxide (CO2) scrubber design eliminates the need to measure and refill CO2 absorbent and the potential for refilling errors. For additional information on SABIC’s resins for ESD and shielding applications, please go to www.sabic-ip.com.